Right from the beginning we came up with such a big defensive effort that brought us a confident win against one of our biggest rivals. After an initial struggle from both sides Yvonne was the first to break the ice with a triple. Still not being able to crack our defense, Zeljko Djokic called his first time-out in the game (4th minute 3-0). Following the short pause Dalma handed out an assist to Candice, to which Betti added two more with a lay-up, and after a close double by Candice our lead grew into the double-digit region. Then Bishop and Yvonne exchanged triples, to which Dojkic added two points from mid-range. With a nice shot from downtown by Yvonne, we were in a ten-point lead again (8th minute 17-7). Dojkic came up with a three-point play, to which Gereben added two more, reducing the gap to five. However, we ended the first quarter being on the front foot (10th minute 20-14). Aleks got the second going with a triple two minutes into the period, forcing the second time-out for the away team (12th minute 23-14). After the break our small forward put two more on the board from close in, and then Debi added another one from the free throw line. Then Betti and Yvonne increased the number of our points further, while still being perfect on the defensive end (16th minute 30-14). With a lay-up by Tina the difference has reached the twenty-point line for the first time in the game (34-14). After that the away side scored their first basket in the period, and then quickly doubled on it. With a little less than a minute remaining on the clock Roberto Iniguez called his first time-out of the game. No other baskets were scored, we were one point shy of a twenty-point advantage at half-time (20th minute 37-18). Queralt began the second half making one of two from the line, to which Bishop answered back with a lay-up. Yvonne and Candice each scored once, then Aleks buried a shot from behind the arc, to which Bishop answered back likewise (24th minute 45-23). Bishop and Eldebrink led a 5-0 period for Szekszárd, to which we answered back with a 10-0 run, forcing KSC's next time-out (26th minute 55-28). Bishop scored from mid-range after the break, and then Dojkic added two more points off a steal, to which Tina answered back from under the rim. In the final minutes of the quarter the guests managed to slightly cut into their deficit, but we were still facing the final stage of the game in possession of a comfortable advantage (30th minute 60-37). Bishop opened the last period with one of two shots made from the line, and then Tina made our first basket from under the rim, and then she put two more points on the board with two foul shots (33rd minute 64-38). Bishop and Tina were on a shoot-out against each other, our center scored two more points, to which Bishop answered back with a double. Then Debi made a very difficult shot from inside the paint, only to be followed by a foul shot from Bishop. Yvonne ran down the court for a lay-up increasing our lead over thirty points (36th minute 72-41)! Theodoreán buried a triple from the corner, to which Kami answered back from mid-range off the assist by Virág. Then it was Virág's turn to score, leaving none of our players without points on the scoreboard. The final buzzer brought us a confident win with a full-Hungarian line-up on court (40th minute 82-48). Roberto Iniguez: We have been through some hard times in recent weeks, but what matters is that we believe in ourselves, in the work we put in and we keep going forward. I am especially happy about the performance of our Hungarian players tonight! They gave me back a lot. It is important that they show themselves, that they have confidence. They played well, with focus, It is very important for us to know that I can count on them! 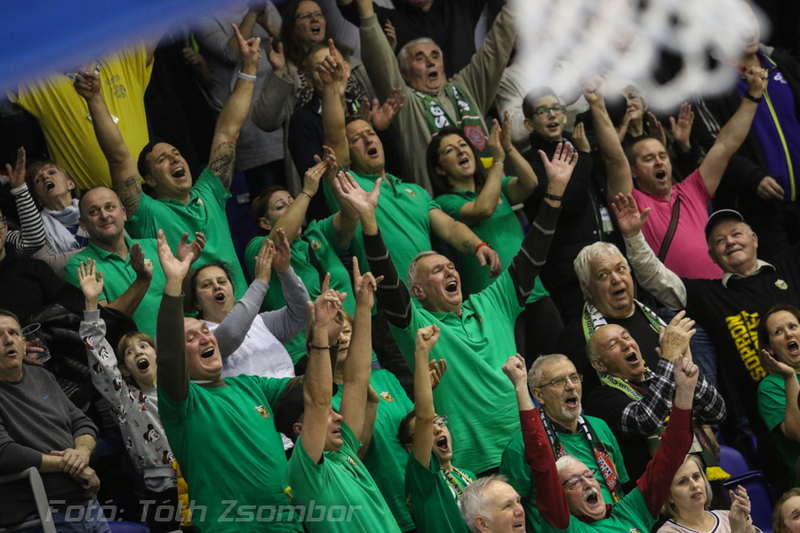 Zeljko Dokic: Congratulations to Sopron, they played well! Turner didn't play her best against Salamanca, but she showed tonight what a big player she is. She played extremely well with motivation on both ends of the court, She gave an extra boost to her team, which we didn't have in ourselves. I feel like we came to Sopron out of focus today. We had a game plan, but we began the first quarter with many mistakes, and that is when I saw that this performance will not be enough today. 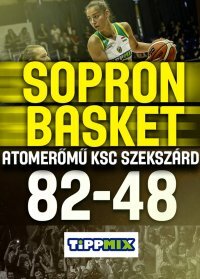 I am sad, because I grew up always wanting to give the best against Sopron, but we have to admit that in Hungary no team can match up with Sopron. I think their roster is the third best in Europe right behind Kursk and Ekaterinburg. I wish for them that they win at least two of their remaining three games in Euroleague, so they can make it to the play-offs, and then to the FINAL4. They are working well, and Hungarian basketball needs that! Dubei Debóra: We have won a crucial game! Thursday's game is a sore spot for us, and we wanted to make people forget about it. We did it, so we are on the right way! Important games are still ahead of us, in which we want to keep performing on this level and deliver more results like this one. Abby Bishop: Sopron played very well! They didn't give us any chance. Sopron is a great team, and there is no shame in losing to them, but tonight's performance and the result is a disappointment. We have to go back to Szekszárd and keep working.